Last weekend, I got final confirmation that I am getting completely detached from the realities of healthy food. It seems I am going overboard with my “healthified” alternatives. I attended Dubai’s 2nd community baker’s “Bake Fest Dubai (BakefestDXB)”. Only on that day in the morning, I decided to participate with my own baked goods. Among other sweet stuff, I made these crispy chocolate cookies. I was convinced, these are the best chocolate cookies I have ever made. I was sure, they would be a hit at the bake sale. I also made my Almond Honey Cake and a vegan version of my Banana Date Loaf. But no, they weren’t a hit. Quite the opposite actually. Perhaps, people expect a more unified look when paying for something. I admit, these cookies were not even in shape. Some were square, other rectangle. Perhaps it was wrong to label my baked goods with “vegan”, gluten free” or “sugar free” labels. When people decide to have dessert, they want the full package and don’t care about healthier alternatives. Although, I have to admit that the “sugar free” label was the most accepted. I had a few nice chats with people who are conscious of gluten or their diet in general. But those people are not of that kind, that decides that they would stuff their faces with desserts for one whole afternoon because it simply tastes good. So they didn’t buy my cookies either. It probably didn’t help that I told everyone (still proudly at that time), that they were made with chickpea flour. Not the most commonly used flour when baking. In the end, I gave a free tasting to the other bake sellers around me. Am I totally deluded? I really believe these are absolutely great cookies. 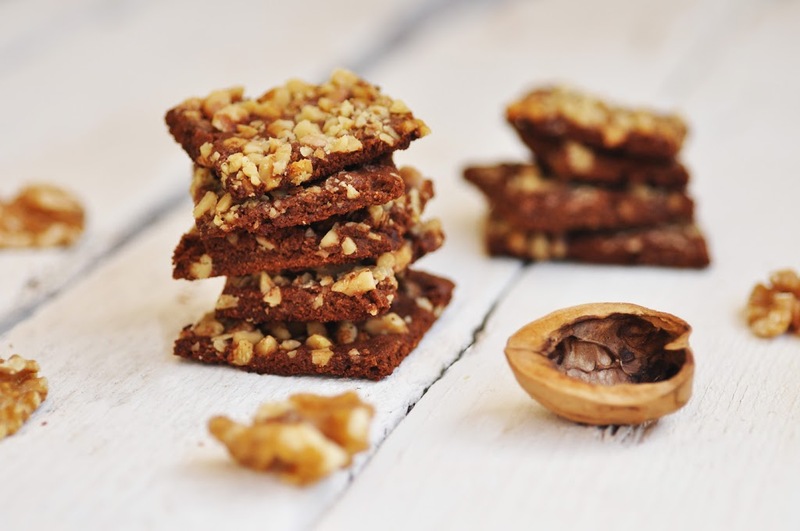 Thin, crispy, chocolate-y with some nut crunch – and from a health perspective, gluten-free, grain free and with very little sugar. I don’t get it. Please, foodies, readers and fellow bloggers: If you make these, please let me know how you liked them. In a large bowl, sift together chickpea flour, salt and cocoa powder. Set aside. In a medium bowl, beat melted butter and sugar until creamy. Combine wet and dry ingredients. Gently fold in the lightly beaten egg whites. Form a disc out of the dough and wrap in cling wrap. Keep refrigerated for 20 minutes. Between two sheets of parchment paper roll out the dough as thin and even as possible, 1/8 inch or less. Remove the upper parchment paper. Sprinkle the walnuts over the dough and gently press in. With a knife, cut through the dough lengthwise and crosswise every 2 inches or so. You will break the dough into cookie sized portions after the baking. Transfer the dough on the parchment paper onto a baking sheet. Bake for 10 to 12 minutes or until edges start to brown. Let cool. Then break into portion sizes at pre-cut edges.